written by Trotsky, edited by Mish. see addendum. Few markets are as widely misunderstood and subject to so many misconceptions as gold. Many of those misconceptions stem from gold's dual role as a commodity and money. This post will attempt to clear up some of those misconception with a few facts. Let's start with one key fact. How can I actually claim that 'gold is money'? After all, it is not used as official money anywhere and barring isolated instances of payments made from a digital gold account, it is unlikely that one will ever make a payment in gold these days. In addition, central banks seem intent on 'demonetizing' gold, as the biggest CB holders of gold (except the US) continue to unload it, ostensibly to earn the higher returns provided by bonds. Selling gold for returns is actually a spurious argument, because reserves are just that: reserves. And the primary purpose of reserves is not to produce a return. In spite of all this, we still know that gold is money, because it trades in the market as if it were money. Let's see if we can prove that thesis. If gold's price were determined by fabrication demand alone (jewelry and industrial uses), it could not possibly trade at a price of $650 oz. Many gold analysts, from the mainstream to fringe groups such as the Gold Anti-Trust Action Committee (GATA) claim that they can predict what the gold price will do by adding up annual fabrication and investment demand (as well as dehedging demand by miners) and contrasting the resulting total with annual supply (mine supply, central bank selling, disinvestment and scrap). In short, they analyze the gold market in the same manner as they would analyze the copper market. It should be immediately obvious that this can't be correct. After all, nearly the entire gold ever mined (approximately 150,000-160,000 tons) is still here. In short, the total potential supply of gold is some 97-98% greater than the gold produced every year (approximately 2,600 tons). On that basis it makes no sense to apply traditional commodity supply/demand analysis based on annualized trends in the gold market. Simply put, there is a big difference between commodities that are effectively used up (aside from scrap residual returning to the market every year) and a commodity the indestructibility and durability of which inter alia made gold the 'money commodity' in the first place. 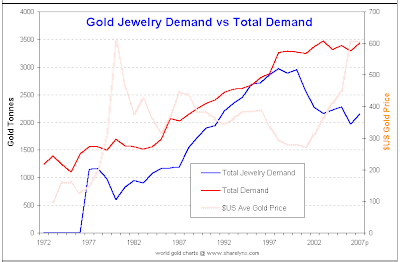 One can further illustrate gold's unique nature as money with a study of gold prices vs. jewelry demand. If record fabrication demand for gold (jewelry) must be good for the price of gold, then a historic high in jewelry demand should in theory coincide with a high gold price. However, record high jewelry demand in 1999 - 2000 in actual fact coincided with a 20 year bear market low in the gold price - the exact opposite of what traditional commodity supply/demand analysis would suggest. We can therefore conclude that there must be a source of gold demand that is of far greater importance than the jewelry and industrial demand components, and that demand constitutes the true driver of the price of gold in terms of fiat money. Indeed, there is. This demand component is called 'monetary demand'. Monetary demand and the supply of gold is actually best described as the 'degree of reluctance of the current owners of gold to part with their gold at current prices' since, as mentioned above, some 160,000 tons are owned by somebody already. De facto gold acts in the markets as if it were another currency rather than a commodity. It often keys off other currency cross rates, such as dollar/euro , and has a strong tendency to ignore all the typical supply/demand analysis thrown at it by the mainstream (including the World Gold Council which should know better). A rising gold price usually begets falling jewelry demand, which is exactly what the theory of price elasticity would suggest. But at the same time, rising prices actually tend to stoke investment demand, just as a developing uptrend in the stock market tends to invite more demand rather than less as this chart, courtesy of Sharelynx Gold shows. Click on the chart for a better presentation. The above chart shows that the record high in jewelry demand coincided with the 20-year bear market low in the gold price. So what was driving the price of gold higher? We know it was monetary demand driving the price because the total fabrication demand for gold has been basically flat since 1999. Ironically enough, the chart also shows the price of gold was falling for over 20 years even as fabrication demand was rising. This is further proof that fabrication demand is not the most important driver of the price of gold. Finally, it should also be noted that some jewelry demand, especially in India, is in reality monetary demand in disguise. "When we started our gold fund in 1993 - which proved to be six or seven years too soon - I mistakenly thought that my downside was protected by the fact that jewelry demand was fairly vibrant. But I was wrong. I think gold moves up and down based on investment demand mostly." The WGC (World Gold Council) meanwhile tries to gauge 'implied investment demand' respectively 'dehoarding' retroactively, by adding up known new annual supply (from mining, scrap, central bank selling and hedging) and contrasting it with known annual fabrication demand. The difference, it reckons, must represent 'implied investment demand' (presumably the demand from gold ETF’s figures in these calculations as well these days). However, as we noted, investment demand is also expressing itself by the reluctance of current gold holders to sell at a given price. This reluctance can not be measured, and actual investment demand is therefore also not measurable. 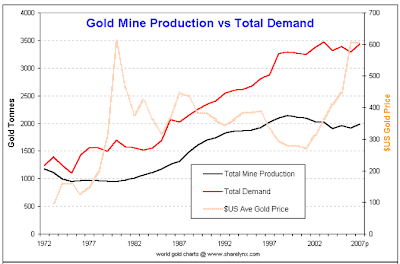 The above chart depicts another peculiarity of the gold market’s supply/demand situation: As the price of gold rises, mine production actually flattens out and falls. There are two reasons for this unusual response to higher prices. During low gold price environments, mines are forced to ‘high grade’ (i.e., mine higher grade portions of their orebodies). Once the price rises, they shift their mining activities to lower grade portions of their orebodies, that haven’t been economic to mine previously. During periods of low gold prices, exploration spending falls, so that once prices rise, very few new mines are set to open and take up the slack from depleted mines. It can take up to 7 - 10 years from the discovery of an economic orebody to the point when mining can begin. What motivates monetary demand for gold? To answer this question one must look back at how gold evolved to become money in the first place. First of all, it always was a commodity with a demand based on its usefulness for creating ornamentation and jewelry, so there was a prior demand for gold that made it useful in barter. In addition to that, its non-corrosiveness, divisibility, fungibility and easy portability weighed in its favor for use as money. Lastly, its scarcity and the fact that its supply is unlikely to suffer sudden increases, regardless of the wishes of the money issuing authorities, made it a prime candidate to act as a store of value. There is a single historical exception to this gold supply dogma, and that's when Spain imported (stole) gold from the New World in the 17th century leading to inflation in Europe. Nowadays, mine supply is around 2% of the total stock of gold per annum and it's highly unlikely there will be much deviation from this percentage. Thus a similar gold-based inflation today would be extremely unlikely. This latter point - that the State can't create gold out of thin air - is what lies at the heart of the monetary demand for gold. In our modern day fiat money system with its fractional reserves banking systems and free-floating paper currencies, gold is the only form of money safe from the depredations of central bankers. It therefore serves in the widest sense as a barometer of confidence in this central bank administered system. Considering that the US dollar has lost about 97% of its value against gold since the Federal Reserve has been in business, one can conclude that confidence in fiat money has been waning rather precipitously over time. This trend is certain to remain a one-way street over the long term, with occasional fluctuations as confidence in paper (or digital) money waxes and wanes. Unfortunately, this sad state of affairs doesn't seem to worry the engineers of inflation. They only get worried when it happens too quickly (so fast that everybody takes notice). One should add here that in the back of the mind of the typical monetary bureaucrat there is this little voice that says: "If push comes to shove, we can always take it back by force." After all, it wouldn't be the first time. In the shorter term, the motives of gold holders who to refuse to sell (possibly even adding to their position) often depend on immediate concerns such as real interest rates, inflation expectations, the spread between short and long term interest rates as a proxy for the likely bias of monetary policy, and the exchange value of the US dollar. Typically gold is a counter-cyclical asset that does best in real terms when liquidity evaporates. At times however, there can be pro-cyclical demand when equity, commodity, and gold prices are all rising strongly, and liquidity is more than abundant. In the end, such price fluctuations in gold are a bit like Warren Buffet's famous remark about the stock market being a 'voting machine in the short term and a weighing machine in the long term'. In the short term, all sorts of considerations can be used to 'explain' movements in the gold price, but in the long term, gold acts as the aforementioned barometer of confidence in central bank issued fiat money. Up next: Why does fiat money seemingly "work" at all? Mish asked me if I would consider writing a series of posts on his blog about gold. I was pleased to take advantage of his offer. Together we came up with the topics, I did the writing, and Mish did the editing. A question came up as to what name to make these posts under. The name “Trotsky” had its origins as a joke handle I started using a long ways back on Kitco. I'm as anti-Leon Trotsky as one can possibly be. I'm not particularly fond of the handle anymore, but it's now the name I am associated with and we decided not to change it on short notice.